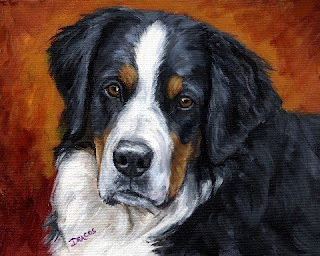 This is a painting of a Bernese mountain dog on a muted red/orange background which I recently finished and which was not a commissioned painting. Thus, it is for sale. 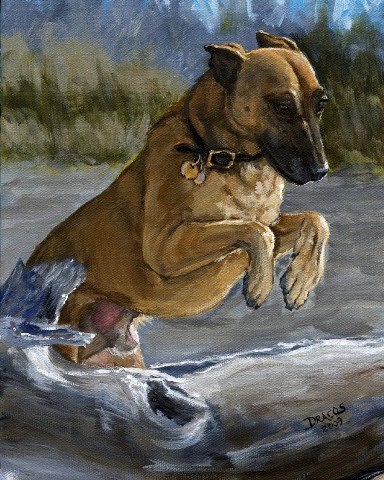 It's an original acrylic painting on an 11x14x1.5" gallery-wrapped canvas (1.5" sides, painted same as the background, no staples, wired to hang). I'm selling it for $100, plus shipping costs. It is also available for sale elsewhere, so I can't guarantee that it's still available. If you would like to buy it, email me, dottie@wildwildthings.com, and I'll send you a bill for its purchase. This is a recent commission I've done for a customer's wife's birthday. I love the action in the dog's body, the intensity in his face, and the soft colors except where the strong sunlight hits the high spots on his body. It was a pleasure to do this painting.